A major concern with most industries (especially retail and small businesses) is public perception and appearance. Parking lot sweeping helps maintain the public’s perception of cleanliness and order, but it does much more than simply enhance the appearance of a property. Contracting with a sweeping company to perform regular cleanups considerably extends the service life of the parking lot as well as the floors inside buildings that are served by the parking lot. However, there are several concerns associated with parking lot sweeping. Dust, fine particles, and dirt frequently discovered on parking lot surfaces act as a catalyst that damages paved surfaces. These particles are also often dragged into the building, leading to premature wearing of flooring. The cost involved in replacing flooring and paving materials generally exceeds the cost associated with regular sweeping. Concern 1 – Parking lots are not swept frequently causing dirt and debris to be tracked into stores. The debris and dirt collected in the parking lot is abrasive, gets dragged into stores and damages the floors. Micron sized grainy matter in the parking area can also get into products and food. During breezy conditions, dust found on parking surfaces become airborne making a mess and causing respiratory issues. Pollutants from parking lots contaminate storm water runoff during rains. However, consistent scheduled sweeping services keeping the parking lots looking clean and fresh and ensure better quality of the air we breath. Concern 2 – The company providing parking lot sweeping uses equipment that are not maintained properly. Some companies use cleaning equipment that are not maintained properly. This can often cost far more in damage and inconvenience by not having appropriate equipment to get the facility cleaned properly. Use parking lot sweeping services of a company with a larger fleet to minimize the possibility that poorly maintained vehicles are criss-crossing your parking lot. Concern 3 – Cheap parking street sweeping services. There is a saying that “cheap work is not good and good work is not cheap”. Cheap services usually involve inexperienced contractors that may do more damage than good. Also, cheap work does not last long. You must use the parking lot sweeping services that include blowing off side-walks, vacuum cleaning parking areas, cleaning debris and leaves under vehicles, and keeping the grass areas totally free of debris. Concern 4 – Using drivers that are committed. C&L General Services pay their drivers a living wage and the average length of their employment is over 15 years. You must engage the services of companies that specialize in parking lot cleaning to get the “dirty work” properly for clients. Professional companies have the right contractors to get things done the right way. This involves having professional sweepers, state-of-the-art people, and experts trained to use the appropriate equipment. Commitment to excellent sweeping services must be their number one priority. With a routine and professional parking lot sweeping, business managers can certainly expect to have a flawless parking area, offering their clients convenience and cleanliness. Call us for quotes and advisory for parking lot sweeping. We’re the street sweeping experts and we’re responsive, reliable and keep your site looking good – 732-886-1940. Since the first recorded use of asphalt for paving roads in Babylon as early as 625 BC, it has come a long way to become the most popular paving material with huge economic and ecological benefits to humanity around the world. Most people take for granted what a valuable resource asphalt is when in fact it is the primary material used to pave more than 95 percent of the highways and roads in the US! Asphalt is the most preferred paving material because it is cheap, highly recyclable, and does not pollute the air or the environment. Pathways, roads, parking locations, and highways paved with this material are smooth and comfortable to ride on because of asphalt’s noise reduction properties. They are durable, and provide good traction, which makes them safe. Emerging technologies and applications of asphalt paving is proof enough that it will continue being a vital element of the future of humanity. Here are five facts you probably didn’t know about asphalt. Asphalt is a naturally occurring material that is found in asphalt lakes or as rock asphalt (a mixture of asphalt, rock, and sand). It gets its name from the black, viscous, and sticky liquid also known as bitumen. It is typically mixed with mineral aggregate then laid and compacted on a subgrade foundation and a base of crushed stone to create the smooth and durable paved surfaces we drive and walk on. Asphalt is a very economic paving material, and it is not just because it is highly recyclable, but also because it builds highly durable surfaces. A report by the National Asphalt Pavement Association showed that 2.27 million miles of interstate highways and roads in the US are paved with Asphalt. About 80 percent of old asphalt can be removed and recycled, saving the taxpayer up to $300 million each year. This material is such an efficient preservative that it was used by ancient Egyptians in the mummification process. More than 94 percent of parking areas and pathways in the US are paved with asphalt. It is more preferred material over concrete because of its cost-effectiveness, durability, and strength. Asphalt paving is also a versatile substance that simplifies construction, making it ideal for use in a variety of applications in commercial and residential areas. For instance, porous asphalt is increasingly being used in low-impact storm water management areas because it handles runoff water more effectively. A study carried out by the Federal Highway Association found that roads paved with asphalt are so smooth that they reduce the fuel consumption of trucks by as much as 4.5 percent. The same report showed that these roads reduce highway noise by between 3 and 5 dB(A), enabling smoother rides and safer journeys. Besides, the construction of these roads are completed quickly because asphalt paving is easy to work, saving commuters millions of work hours every year and reducing traffic delays. Asphalt makes significant contributions to the cohesiveness and safety of the community by providing jobs and a long-lasting transportation and communication product. Every $1 billion worth of asphalt surface paved creates over 28,000 jobs with no risk to the community or the environment. Paving – What Are Your Needs? According to Wikipedia, our relationship with asphalt began in the 13th century when indigenous people used it as an adhesive for making ceremonial items and building materials. The Babylonians may have been among the first people to use it for road pavements, starting a trend that paved the road for modern civilization. Do you appreciate asphalt more now? If you have a job as a property manager or a property maintenance role, the chances are that trash collection and garbage removal is one of the most challenging tasks you have to deal with every day. Tenants often take this chore for granted, but a manager cannot afford to lose face because of litter, and worse, the problems that uncollected trash can cause in the property. Call it trash collection, portering, manual sweeping, or litter disposal; this is a necessary service to maintain an amenable and visually appealing environment. Therefore, whether you manage a single business property or are in charge of property maintenance for a network of complexes, it is imperative that you find reliable and effective trash collection company that handles property maintenance to ensure that it is sanitary, healthy and tidy. Professional litter patrol, or hand-picking if you may, is a necessary service that goes beyond keeping a property clean and tidy. Property Maintenance – Why choose a professional to handle trash pick up? As a capable property manager, you understand that no one does a better job of trash collection and garbage disposal than a professional with intimate knowledge of how different types of trash should be disposed of. Many managers think that hiring street sweepers and laborers is a simple solution to the complex problems presented by trash. The truth is, while these individuals can do a good job of keeping flat surfaces clean, they rarely ever reach into every nook and cranny of the property. As a part of property maintenance, specialized trash collection includes proper handling of waste which prevents potentially dangerous situations that a property manager may be held liable for. For instance, there are special ways to collect and dispose of dangerous items such as loose nails, broken glass, and chemical-based batteries that a professional knows best. The crew of such a company is typically well versed in handling any kind of trash and as such, are all-rounded in any service to rid your property of junk produced by all kinds of tenants and even construction or repairs personnel. It is also worth pointing out that responsible property maintenance involves proper recycling of discarded materials. Professional portering and litter collection is the surest way to ensure that recyclable waste ends up in the right places. This is largely because the company handling the waste knows where best to take the waste materials for recycling and the waste materials expressly know how to sort them from the point of collection. Hiring a property maintenance company that specializes in trash pickup is a sure way to deal with the litter problem once and for all. A professional company that values its customers knows that every pick up session must leave the property in a spick-and-span condition. A professional, unlike just anyone else picking trash, also knows the potential hiding’ areas of litter and will inspect around the perimeter of the property, water inlets, basins, grass lawns, and curbs for the smallest trash particles that can cause huge problems in the future. Most property managers prefer to schedule trash pick ups and cleaning services with consistent and dependable companies because they often deliver with minimal effort. If you are considering professional property maintenance services, you know what to look for. Trash collection, portering, manual sweeping, trash pickup, litter patrol, “patrolling”, hand picking, or laboring, no matter what you call it, it is the same service. Looking for reliable, efficient, responsive property maintenance? Give us a call at 732-886-1940. We’ll be glad to look at your property, give you a reasonable quote and ensure you’re satisfied with our property maintenance services. 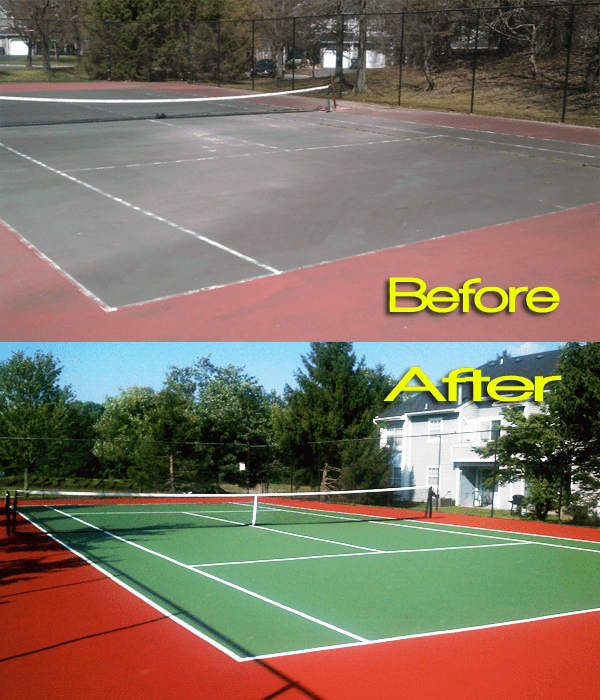 Tennis Court Resurfacing…look at the amazing difference! If you are a tennis player, you know how frustrating this game can be. Many people, at one time or another, have not been proud of how they acted on court. Emotions (generally frustration) have cost a few matches over the years. There are certainly many aspects in the game that need to be in place in order to play good tennis. The tennis court surface is one of them. When a tennis court becomes old and worn, it’s time for a tennis court resurfacing. Puddles on the court are a nuisance for several reasons. They take different shapes and run in different directions. Although they are undesirable, they are commonly a result of a dips in the court surface. However, puddles can be eliminated with resurfacing. During the resurfacing project any existing puddles can be filled in with special filler materials or asphalt. If the puddle is caused by decay of the underlying substrate, the area must be excavated, filled and then smoothed. Over time, tennis courts naturally develop imperfections such as peeling and flaking of the protective coating. Unfortunately such things are inevitable with age. When you see these flaws, think about tennis court resurfacing. Actually, if you initiate a tennis court resurfacing once every three to seven years, you can avoid this unsightly appearance and make the tennis court look and feel like brand new. Happy Homeowners and clients are far easier to deal with when they see good looking courts. Most tennis courts develop some type of cracks. These cracks are often caused by exposure to weather conditions especially in areas with extreme changes in temperature. In the northern portion of the US, the weather can get quite cold causing substantial contraction and expansion to the tennis court surface. This in turn makes court resurfacing necessary. The best solution is to have a professional evaluate the surface, diagnose the cause of cracking, and suggest a remedy accordingly. Apart from the repairs mentioned above, there are several other issues that may need attention. For example, blisters and bubbles can begin to appear in the court surface over time. These imperfections are commonly the result of moisture trapped under the tennis court coating or sloppy application of the coating. Blisters and bubbles can be smoothed by injecting acrylic latex or mastic to re-adhere the coating and smooth the surface. This is probably the least expensive but most effective tip for keeping your tennis courts looking amazing. Keep the tennis court as clean and dry as possible. No one likes to play on a dirty court, so make it a habit to remove debris, dirt and dust at the start of each day. If too much dirt builds up over time, not only is it unsightly, it can cause the court to deteriorate. Cleaning the courts daily will help you avoid all these issues. Looking for professional tennis court resurfacing? We’re responsive, reliable, affordable and make your tennis courts look amazing ! Call C & L Services at 732-886-1940. Have you ever been cited for construction site debris and dirt finding its way onto the street? Perhaps you are worried the local EPA inspector will find your site littered and unclean? According to the EPA, dirt track-out often carried by vehicles leaving construction sites is one of the leading causes of pollution in urban centers. This is considered a serious problem because such pollution materials and sediments easily get washed into water bodies, block storm drainage systems, and even find their way into sales offices. Whether you are a construction or property manager, professional construction sweeping is a necessary service that benefits your property and everyone involved in developing it. It is understandable that building contractors and their subs focus more on building and less on cleaning; after all, the EPA does not specify any techniques or machinery that construction companies must adhere to to keep construction areas and the environment clean. The agency only requires that construction companies implement a ‘comprehensive pollution prevention plan’ for construction projects. Considering today’s challenging construction climate, this means tight project timelines and tight budgets. Because of the unbinding EPA regulations, there must be separate structural and housekeeping efforts, preferably handled by a professional construction sweeping company. When it comes to construction sweeping, any missed area will be noticed, and if it isn’t, it will have far-reaching negative effects on the people and the environment. This is why more and more developers are choosing to hire seasoned sweeping companies to handle the cleanup responsibilities on any construction work. Despite the demanding work conditions, these experts are capable of achieving superb results so that you can focus on construction and not the cleaning. The sweeper’s job typically changes with each job site, but the crew is trained to handle a wide variety of new challenges. As the public gets to understand the importance of Clean Water Act and Stormwater Pollution Prevention Plan compliance more, expert construction sweeping services are becoming more important than ever. The work of a professional construction sweeping company revolves around the understanding of environmental issues associated with construction sites including dust and water runoff mitigation. When hiring a construction sweeping company, it is critical that you understand the scope of work which determines the type of equipment or sweeping technique to be employed. Some of the factors to consider include: the material and density of the debris, whether the material is loose or compact, time-frame and time constraints, what happens to the sweepings, and project-specific job site logistics. Hiring the right construction sweeping company is the ultimate solution to keeping the township and existing homeowners around the construction area satisfied with the cleanliness of the site. Besides, proper cleanup services are good for business because it keeps workers safer and sends the right message to current or future customers who obviously want to live in a clean community with a curb appeal and do their shopping in a clean and tidy environments. There are many considerations to factor in when looking for the right construction sweeping company but reliability, professionalism, and efficiency should be on top of your checklist. Whether you need a one-time cleanup of a home construction site or on-going sweeping services on a commercial construction site, you must do your homework to find a contractor with the best management practices, sweeping expertise, and the right equipment that delivers results. You can do BOTH the easy and the right things, call us for quotes and advisory for construction street sweeping. We’re the construction sweeping experts and we’re responsive, reliable and keep your site looking good – 732-886-1940.